We are witnessing the end, or perhaps the remaking, of SunEdison, briefly the world's largest renewables developer -- and now the destroyer of a massive $10 billion in stock market value. We've seen epic failure at Suntech, Solyndra and the like -- but this is in a different league. In 2014, SunEdison jumped into deep YieldCo waters with TerraForm Power and TerraForm Global. The company made a series of large, questionable acquisitions in First Wind and Vivint, as well as a slew of lesser corporate additions. SunEdison has not reached GAAP profitability in more than five years and lost almost $1 billion in the first three quarters of 2015. When SunEdison's stock was at its peak, the company raised debt rather than equity, and that debt load has returned with a vengeance. It takes a very special type of ineptitude to fail on such a massive scale in what is, by most metrics, a healthy, capital-rich, high-growth renewables market. Other comparable vertically-integrated solar companies with YieldCos such as First Solar and SunPower have managed their capital, acquisitions and personnel in a much more well-paced and judicious fashion. It's evident in their steady growth, global pipeline and actual profits. SunEdison shares closed at $1.78 Friday, giving the company a market cap of $560 million. Its shares peaked at over $32 in July 2015. Yes indeed Paul. You did one HELL of a job setting it on fire. Congratulations! I've written about organized crime regarding renewables (verifiably) and carbon fraud, which is still an ongoing problem in the EU. Now I will touch a bit on cronyism and fascism. This also has also been referred to corporatism and many are unaware of how that works. In the financial world we pay taxes and someone else spends it. Somehow, the same folks keep getting the money whether they lose or win. You pay for it and get no benefit while they have no skin in the game. (NECN) - On This Week in Business, Paul Gaynor, the CEO of First Wind talks about the upturn in the IPO market and his meeting in Washington this week with Treasury Secretary Geithner and Energy Secretary Chu about the role stimulus money has played in helping his business. Yieldcos are the newfangled craze to whet the appetite of yield-chasing investors. Yieldcos carry a significant interest rate risk and their inherent risk profile makes them unsuitable for long-term investors. Yieldcos are also a great tool for sponsor companies to retain profits and socialize losses. David Einhorn gaining board seats could spark a catalyst. On a SOTP parts basis, shares appear to be worth over $15 per share. Managerial changes and asset sales should act as additional catalysts for unlocking shareholder value. David Einhorn's Greenlight Capital (NASDAQ:GLRE) will add a former partner from the hedge fund to the board of SunEdison (NYSE:SUNE). Effective immediately, Claire Gogel will join the board of SunEdison. According to filings, Greenlight Capital will look to sell various assets or the company outright. SunEdison also agreed to a deal with Greenlight not to issue equity for two years without the approval of almost all members of the board. The market is fed up with SunEdison and slammed the company over 90% in only the last six months. Is this decline justified? Is there no value to this company? 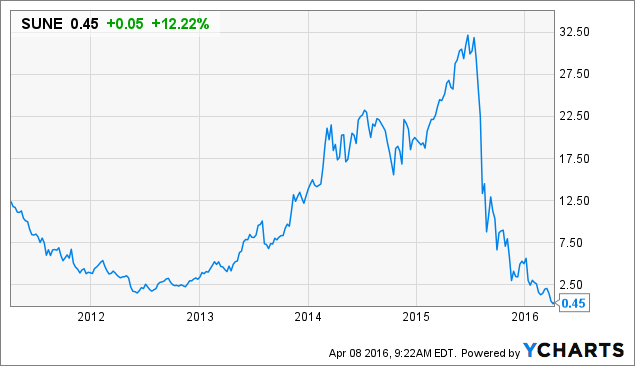 Will Einhorn be able to unlock shareholder value? Einhorn's presence and recent board activity tell us that he sees the exceptional value or he would've left months ago. Let's see if there is a potential opportunity in SunEdison at current levels. One man that is a player in this mix that both Barb and I have written about is Patrick Wood III. He is at Sun Power (among others) and we are keeping a close watch on developing issues. Here is an article from a short while back. On Wednesday, SunPower, a solar panel manufacturer based in San Jose, Calif., accused a leading renewable energy developer of stealing trade secrets. In a federal lawsuit filed in California, SunPower claims that SunEdison, a solar developer based in St. Louis, MO, obtained access to proprietary business information from former SunPower employees who joined SunEdison between 2011 and 2014. SunEdison hired 20 employees from SunPower in the U.S., Spain and Italy between 2011 to 2014, according to the complaint filed on Wednesday in the U.S. District Court for the Northern District of California. The information allegedly purloined by SunEdison included “distribution channel strategy information, market research, sales roadmaps and other highly confidential documents,” according to Bloomberg. The lawsuit is indicative of the rapidly escalating intensity of competitive shaping the solar power industry. Finally, a clip from CNBC last week on the future of the solar industry. Is the solar industry sizzling out? D.R. Barton from Money Map Press says news of SunEdison's bankruptcy risk is an isolated incident, and does not represent the larger solar industry.